5sec Google Maps WP plugin - No setup. No code. No bulls**t. Just maps! Only one (and the only mandatory) parameter is defined – address. Description bubble will be visible immediately after map is loaded (show_description=”true”); if this is false (default) you need to click on the marker to show the bubble. Icon is changed to “star” and we entered a description in “title|rest of text” format. Full screen view is enabled to. After defining width and height in pixels we set the map type to hybrid (satellite + roads) and zoom level to 10 (which is 50% of [0-20]). Full screen view is enabled to. 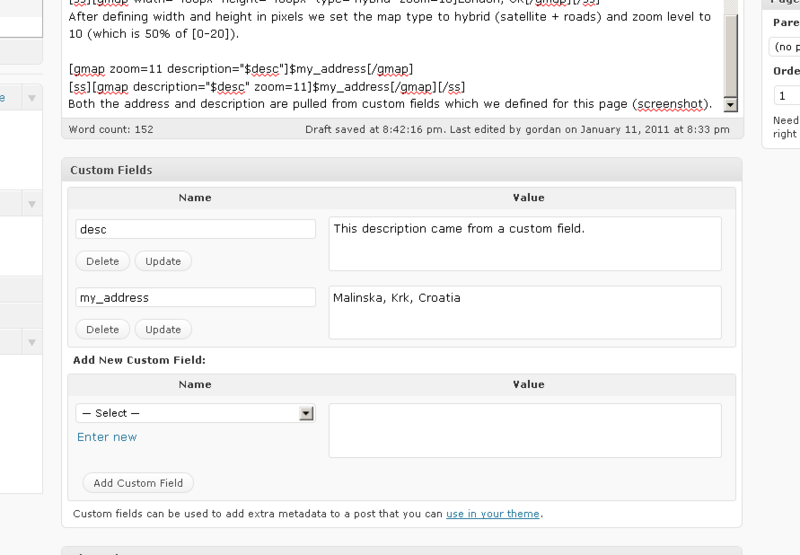 Both the address and description are pulled from custom fields which we defined for this page (screenshot). Click on the marker to toggle description. Full screen view is enabled to. The icon is custom, defined via full URL and debugging is turned on.